Nairobi — The Ukay Centre in Westland was finally flattened on Thursday, marking an end to what environmentalists termed as a monument of impunity. The last standing section of the building collapsed with thunder, as tens of elated onlookers cheered on the bulldozer. A giant cloud of dust hovered in the air and when it settled, everything was flattened. This now means the Nairobi regeneration committee can now proceed to reclaim more riparian land with their eyes pegged on the Taj Mall. 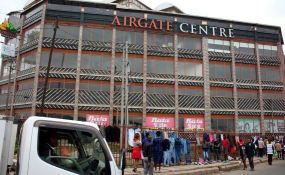 But the owner of the mall now says due process was followed in the construction of the expansive building, which according to National Environment Management Authority sits on riparian land. Ramesh Gorosia has dared the government to bring down the multi-millions mall, but the showdown, he says will be in court. "The road is not needed now. If there is any mistake, it can always be revised after 50 years," the owner, who was flanked by a group of youthful men said. The mall has been a centre of controversy for years and is usually blamed for traffic snarl up in the area and delayed completion of Outering Road. Other than being on a wetland, the mall is built on a road reserve. The heightened efforts to claim wetlands in the country started with demolition of Southend, another multi-million-shilling mall at the Lang'ata Road-Mbagathi Way roundabout on August 8. Earlier, Java restaurant and Shell Petrol Station in Kileleshwa were demolished. Despite resistance, President Uhuru Kenyatta has vowed to sustain the crackdown that will so more than 1,000 buildings, erected on wetlands demolished. Kiambu Governor Ferdinand Waititu however wondered why the government keen on demolishing buildings is instead of asking the owners to "move the rivers a little bit." "If there is a building near a river, one should be told to cater for expenses used to move the river a little bit. To demolish a building is not a solution. It is such a big loss," he said during a church service attended by Deputy President William Ruto on August 19. Environment conservationists have lauded the demolitions as "revolutionary".